Product prices and availability are accurate as of 2019-04-22 04:50:36 UTC and are subject to change. Any price and availability information displayed on http://www.amazon.com/ at the time of purchase will apply to the purchase of this product. 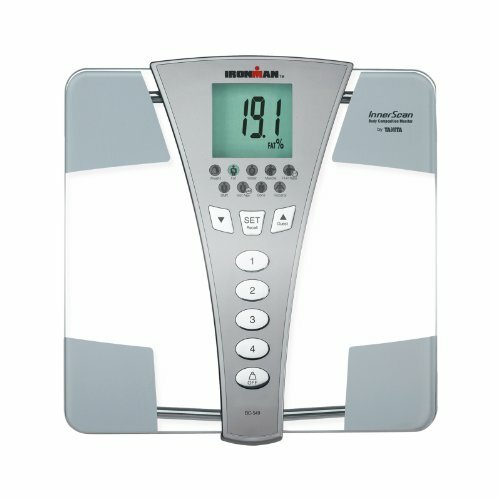 Competitive Edge Products, Inc is happy to offer the Tanita BC-549 Ironman Body Composition Monitor. The Tanita BC-549 Ironman Body Composition Monitor utilizes transparent electrodes to monitor weight, body fat percentage, body water percentage, muscle mass, physique rating, metabolic age, bone mass, visceral fat, and basal metabolic rate. With this scale, you are now given the capability to monitor your health on a daily basis from the comfort of your own home! The transparent electrodes on your feet provide a bio-electrical impedance analysis, giving you your results. The sleek, modern, tempered glass makes monitoring your health stylish, while continuing to provide the same accurate results Tanita is known for. The large, back lit LCD display allows you to read your results with ease. The low profile, extra wide platform makes accessing the scale simple and effortless. Tanita's new development enables individuals to monitor body composition on clear surfaces without noticeable electrodes. This advancement will add to the aesthetic beauty of Tanita's one-of-a-kind range of tempered glass designs while offering the exact same high level of precision. This transparent electrode scale makes use of Bioelectrical Impedance Analysis (BIA) technology to monitor your complete body composition. Dimensions include the full range of Ironman functions.